In order for people to be able to travel economically to space, for space tourism and for other purposes, we need reusable launch vehicles. 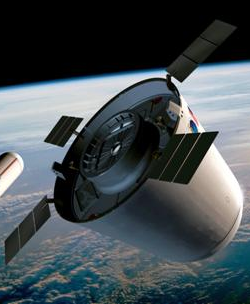 All commercial transport industries use reusable vehicles - and so will the commercial space transport industry. Luckily research aimed at developing low-cost reusable launch vehicles has increased recently - though total funding is still barely 2% (!) of government funding for space activities. The following is a list of projects under way today and some significant projects of the past. Some are aimed initially at sub-orbital flights - a much easier target than getting to orbit, as demonstrated by SpaceShipOne . Others are designs for orbital vehicles. Ultimately, the only ones of importance are the piloted, passenger-carrying vehicles. Winner of the $10m Ansari X-Prize , this suborbital passenger-carrying spaceplane was designed by Burt Rutan 's Scaled Composites , famous for graphite composites, and also the integrating contractor for the former Roton . Following their successful bid to win the X-Prize , Scaled Composites are now turning their eyes to the next step: the development of a commecially viable passenger-carrying suborbital space vehicle. 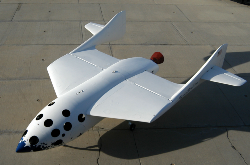 SpaceShipOne features a rubber-nitrous oxide hybrid rocket engine and cold gas attitude control thrusters; a graphite/epoxy primary structure; 3-place, sea-level, shirt-sleeve cabin environment; a low maintenance thermal protection system; and a unique feathered reentry system. The spaceplane is carried under the belly of Scaled Composites ' White Knight carrier aircraft. The White Knight is a piloted, twin-turbojet research aircraft derived from the Proteus intended for high-altitude missions. Its first flight was on August 1, 2002. It provides a high-altitude airborne launch of SpaceShipOne . 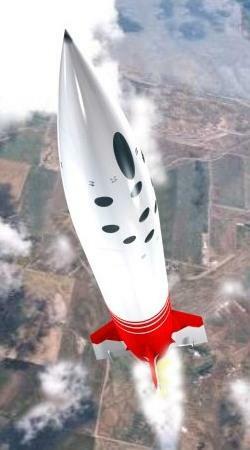 The White Knight is also equipped to flight-qualify all the SpaceShipOne systems, except rocket propulsion. The aircraft's cockpit, avionics, life support systems, pneumatics, trim servos, data system, and electrical system components are identical to those installed in SpaceShipOne . The White Knight drops SpaceShipOne at 50,000 ft. SpaceShipOne then climbs nearly vertically under power at a 3-4g acceleration. The hybrid engine burns out at Mach 3.5, 65 seconds after ignition. The spaceplane coasts to approximately 100 km. (328,000 ft.) before free-falling back to earth. Pilot and passengers experience microgravity above the atmosphere for 3.5 minutes. Before reentry, the pilot raises SpaceShipOne 's twin tails to vertical. 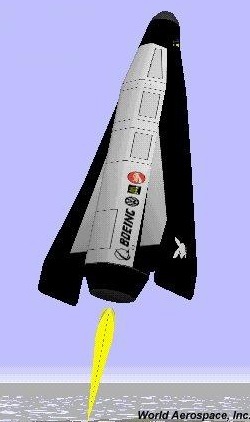 This feathering approach stabilizes the spaceplane without need of pilot input. Reentry deceleration is up to 5gs. After reentry, the pilot returns the twin tails to horizontal, and SpaceShipOne glides to a runway landing. SpaceShipTwo is the commercial follow-on to SpaceShipOne , designed to carry two pilots and six passengers on a suborbital space trip lasting two and a half hours. A scaled up version of its predecessor, SpaceShipTwo is dropped from beneath a larger version of the White Knight , dubbed White Knight Two . 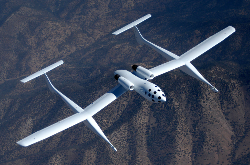 An order for five SpaceShipTwo /WK2 spacecraft was placed by Virgin Galactic in July of 2005. Following on from SpaceShipTwo is SpaceShipThree, the ultimate objective: a HTOL TSTO spacecraft capable of reaching orbit. A passenger-carrying reusable SSTO VTOL rocket designed to carry 50 passengers to 200 km Earth orbit started as part of a study program by the Japanese Rocket Society . Since none of the space agencies of the world were studying how to make launch services available to the general public, the JRS started a Space Tourism Study Program in 1993, with the objective of getting the price of a flight to orbit down to around $10,000 per passenger. Work on Kankoh-maru has grown steadily in depth and breadth ever since, and has helped to accelerate the acceptance of space tourism as the direction for space development work today. Based loosely on earlier designs such as the " Phoenix ", the design has been described in a number of publications (many by Isozaki ), and is currently being further refined in the third phase of the JRS study (See: The JRS Space Tourism Study Program Phase 2 ). 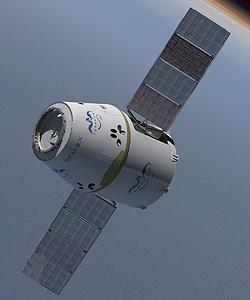 SpaceX 's Dragon is a small orbital spacecraft designed for transporting people and goods to and from the ISS . It has two configurations, an unmanned cargo configuration, and a crew/passenger configuration capable of transporting up to seven people. It is being built by a consortium led by SpaceX under NASA 's Commercial Orbital Transportation Services ( COTS ) initiative. Dragon is also equipped with an ISS -compatible dock that is exposed through a removable nosecone. Return to the Earth's surface is achieved through a parachute-assisted splashdown and recovery. Dragon is delivered into orbit on top of the Falcon 9 two-stage launch vehicle, an expanded version of the Falcon 1 rocket that completed a successful test launch to orbit on 28 September 2008 (after three prior failures). 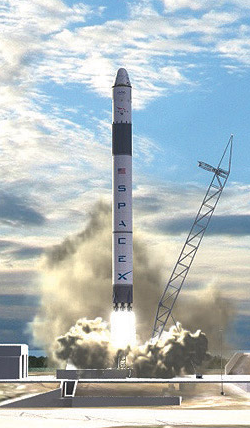 Both stages of the Falcon 9 are intended to be reusable. The intended use for the combined vehicle is primarily to serve as a replacement for the Shuttle fleet after their retirement, so space tourism is not an overt goal. 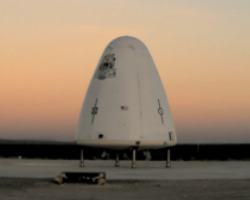 Unlike vehicles aimed explicitly at the space tourism market, the Dragon /Falcon 9 combination is not fully reusable, and so is unlikely to withstand competition from a fully reusable orbital vehicle such as those proposed by Scaled Composites and others. However, until such time as such vehicles become available it may be the first privately financed space vehicle to be capable of delivering people, space tourists or otherwise, to orbit. A suborbital VTOL vehicle being developed by Blue Origin , along similar lines to the former ROTON and Phoenix projects and also to Kankoh-Maru , although unlike these vehicles it is not designed to take passengers into orbit. Blue Origin , founded by Amazon tycoon Jeff Bezos , is famously secretive about its plans and progress, so while it is reasonable to suppose that New Shepard would be the basis for a further orbital design analogous to Kanoh-Maru, the company have not announced one. The New Shepard is named for Alan Shepard, the first American in space. Blue Origin test launched a demonstrator vehicle in 2006 called Goddard (shown), similarly named for rocket pioneer Robert Goddard . Ascender is a sub-orbital spaceplane from Bristol Spaceplanes carrying two crew and two passengers intended to provide proof-of-concept for the development of the Spacecab /Spacebus spaceplane, and is capable of reaching space (though not orbit). As well as being an entrant for the X-Prize , Ascender is intended to return commercial revenues through its passenger carrying capability. Spacebus a design for a 2-stage passenger-carrying HTOL by the company Bristol Spaceplanes in Britain. The first stage uses jet engines for take-off, followed by rocket engines to climb to high altitude for separation, after which the upper stage uses rocket engines to reach orbit. This configuration has a number of advantages described at length in papers by David Ashford (including the recent "Space Tourism - How Soon Will it Happen? " and the 1990 book "Your Spaceflight Manual: How you could be a tourist in space within 20 years "). Using existing jet and rocket engines is very attractive in reducing initial development costs. And though new air-breathing rocket engines might be more efficient, they're not needed initially (the first stage just has to be a bit bigger and use a bit more fuel). And going high with the first stage makes separation easy as it's in thin air, so even hypersonic loads are small. Spacecab is a scaled-down version of Spacebus designed to carry 6 passengers. It's attractive as a first step to HTOL launch services since it uses only existing technology, and could start passenger operations much earlier than a vehicle requiring new engines to be developed. Michelle, or 'Modular Incremental Compact High Energy Low cost Launch Experiment', is a manned reusable sub-orbital SSTO proposed by TGV Rockets . Its modular structure is designed to allow a variety of payloads such as scientific instrumentation to be substituted. By aiming at the sub-orbital market first, Michelle aims to bridge the gap to more expensive orbital vehicles by allowing the necessary technology to be developed incrementally. EADS Astrium 's suborbital HTOL vehicle is a spaceplane designed to carry four passengers 100 km into space, where they will experience three minutes or more of weightlessness during the 90 minute trip. The Astrium space jet will take off and land conventionally from a standard airport using its jet engines. At about 12 km altitude, a rocket engine takes over to boost the vehicle's altitude to approximately 100 km. After atmospheric re-entry, the jet engines are again restarted for landing. BSC Spaceship is a VTHL suboribtal space tourism vehicle proposed by the Benson Space Company ( BSC ). The design is partly inspired by, and is an amalgam of, a number of NASA and Air Force vehicles including the X-2 and X-15. The BSC Spaceship is powered by hybrid rocket motors sourced by SpaceDev , and will launch vertically to an minimum altitude of 65 miles. The vehicle is designed to allow for lowered G-forces on re-entry, and features a cabin of large, spread-out windows for improved views of Earth and space. 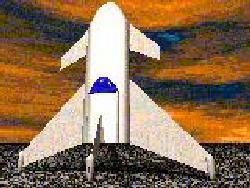 Armadillo Aerospace is a research and development team headed and funded by computer games entrepreneur John Carmack . The Texas-based team has already developed small manned and unmanned atmospheric test landers powered by hydrogen peroxide rockets. Armadillo Aerospace is now competing for the X-Prize with what it believes to be the simplest possible design. The rocket, dubbed Black Armadillo , is powered by four hydrogen peroxide engines feeding from a 1000 gallon composite fuel tank. A computer takes attitude measurements from gyroscopes and uses those measurements to throttle the engines 200 times per second, stabilizing the craft. The pilot can also steer the rocket via joystick. The pilot and two passengers sit with their backs to the nosecone. This unusual position is taken to ensure that the occupants encounter reentry deceleration on their backs as the vehicle reenters the atmosphere nose first. Ascent acceleration is considered by Armadillo Aerospace to be mild enough to permit the unorthodox seating arrangement. The rocket lifts off vertically, and at burnout coasts up to 100 km (62.5 miles). 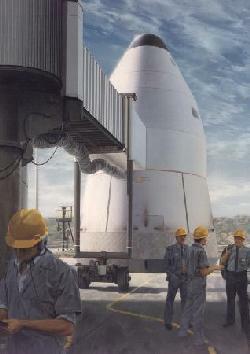 The rocket makes a nose-first reentry, with foam insulation protecting the aluminum nose section from reentry heating. A drogue chute frees the main parachute, and landing is cushioned by an expendable aluminum nose cap that compresses on touchdown. Another approach to the problem of achieving HTOL from Kelly Space & Technology - towing the vehicle like a glider at take off in order to save using fuel in the early part of the flight, thereby starting at high altitude with full propellant tanks. It should be possible to get this to work - like in-air re-fuelling and two-stage HTOL . Which will end up with the lowest operating costs? Time will tell! The SpaceClipper SC-1 is a suborbital reusable VTOL spaceplane proposed by SpaceClipper International, designed to carry up to ten passengers and two flight crew to an altitude of 140 km and back. Although it descends horizontally, it takes off and lands vertically. The SC-1 features shield doors which protect the craft during ascent and descent, but open to allow views of space and Earth for the four minutes that the vehicle is weightless at the top of its trajectory. A follow-on fully orbital spaceplane dubbed SC-2 is also proposed, building on the experience gained in developing and operating the SC-1 . Xerus is a two-person reusable spaceplane proposed by XCOR Aerospace, which takes off and lands like a conventional aircraft. It is capable of climbing suborbitally to 100km using a cluster of reusable rocket engines developed by XCOR to use non-toxic propellants. 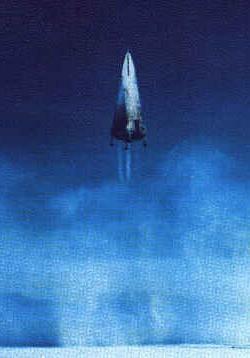 After a short period of weightless free fall the vehicle then re-enters the atmosphere. 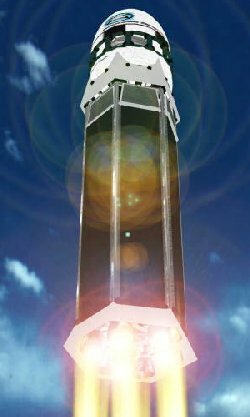 While the primary market for Xerus is space tourism, the vehicle is also being targeted at microsatellite delivery and suborbital science payloads. 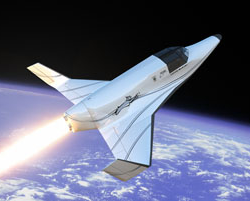 XCOR 's Lynx , announced in March of 2008, is a follow-on design based on Xerus . Like Xerus , Lynx is a two-person suborbital spaceplane designed for the space tourism market but also aimed at science and research applications. XCOR 's primary business is the development of reusable rocket engines, in pursuit of which they previously developed and flew the EZ-Rocket airplane as a demonstrator and test bed for their reusable rocket technology. 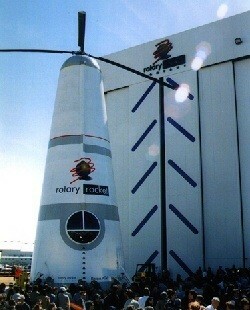 Much of the engineering team previously worked on the propulsion systems of Roton at the former Rotary Rocket company. The Alpha Project is a fully reusable two stage vehicle proposed by World Aerospace, Inc. The upper stage, dubbed the Alpha CX-1A SRV (Space Reusable Vehicle) is a three-person spaceplane designed to take one pilot and two mission specialists into space. Intended to use off-the-shelf technology where possible, the CX-1A may also be launched from the ground as a suborbital spacecraft. The first is an Air Launched Horizontal Landing (ALHL) solid rocket booster RLV derived from the Pegasus by Orbital Sciences Corporation. This vehicle will carry the CX-1A upper stage for the flight test phase. The second is a HTOL liquid rocket flyback booster RLV . This vehicle will carry the CX-1A in the piggyback configuration and is ultimately expected to evolve into the final RLV lower stage as the design matures. World Aerospace, Inc. is targeting the Alpha series of space planes for orbital and suborbital space tours, as well as crew transfer, small satellite launches, and emergency rescue. An innovative HTOL design by Mitchell Clapp using in-flight refuelling of a single-stage vehicle to enable it to reach orbit. Taking off with almost no liquid oxygen in its tanks, it can then effectively "take off" with full tanks at high altitude. The upper stage of a 2-stage vehicle is limited to a mass of about 100 tons, whereas Black Horse could have a fully-fuelled mass several times this. Air forces use in-flight refuelling routinely and have accumulated enormous experience, so safety should not be a problem. Currently being pushed by the company Rocketplane Inc . (formerly Pioneer Rocketplane )..
Rocketplane XP is a scaled-down sub-orbital version of the same basic design. The XP stands for 'X Prize ' denoting its role as an Ansari X Prize contender. A concept for a series of VTOL vehicles leading up to a passenger-carrying version. Currently Kistler Aerospace Corporation is developing a 2-stage VTOL launch vehicle for small satellites. In 1997 Kistler Aerospace moved to Australia and will start launching from Woomera. Pioneer Rocketplane (itself now Rocketplane Inc .) bought Kistler Aerospace in 2006 and it is now known as Rocketplane Kistler or RKP . Thunderbird is a low cost fully reusable VTOL rocket from UK based Starchaser Industries , which has an established track record in unmanned rocketry. It is an X-Prize contender, and is designed to carry three people on a short sub-orbital pleasure flights into space. The vehicle uses existing off-the-shelf components wherever possible to minimize development cost, combined with an advanced composite for the airframe. The primary propulsion is provided by LOX /kerosene engines which carry the vehicle to a maximum altitude of 100km after burnout before re-entering tail-first using a steerable parasail. Reaction control is handled independantly by cold gas thrusters. The Thunderbird is a single stage vehicle, but composed of two discreet and seperable units: a command module, which includes the cabin, life support, and reaction control system, and a propulsion module comprising the fuel tanks, engines, and landing gear. In an emergency the command module is detachable from the rest of the vehicle, allowing the crew to bebrought down independently. 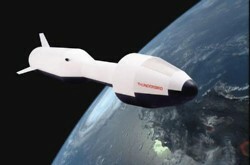 Nova is a scaled down version of Thunderbird designed to bridge the gap between previously flown unmanned rockets and Thunderbird , and is currently in construction. Standing at roughly 2/3rds of the height of its 52 foot larger sibling, Nova is designed to carry a single person into space, to a maximum altitude of approximately 100km. Although not an X-Prize contender due to its less than three person capacity, Nova is intended to be the world's first privately developed spaceship. Fully reusable VTOHL first stage launch vehicle for boosting a range of upper stages to orbit. Based on the Ukrainian-built " Zenit " rocket using kerosene and LOX engines, and promoted by Buzz Aldrin and Ron Jones. See "Star Booster - A Commercial Solution to Cost Effective and Versatile Reusable Space Transportation ". 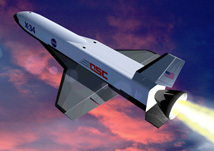 A TSTO spaceplane design from Space Access LLC . The first stage uses an "ejector ramjet" to power a hybrid airbreathing engine in the first stage to reduce aerodynamic drag. The second stage, which can use one of several different configurations, is contained inside the first and released at high altitude. 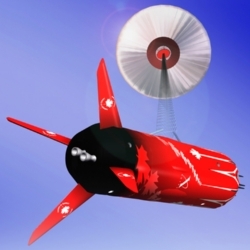 The Canadian Arrow is a two-stage suborbital rocket designed to take three people into space and back. The first stage is a liquid propellant stage whose aerodynamic shape and thrust chamber are closely based on the V2 rocket, which was also the basis for the Mercury rocket used by Alan Shepard. It boosts the vehicle to the edge of space at a maximum of 4.5G acceleration before detaching and falling back for a parachute-slowed splashdown and recovery. To assist in recovery, the first stage has a natural positive buoyancy achieved without the use of floatation gear. The second stage uses solid rocket engines to rise to an eventual maximum altitude of approximately 70 miles. It is also designed to be an escape pod and can be separated from the first stage at any point, including the launch pad in an emergency. In normal flight, it will reenter the atmosphere using a reentry ballute and three main parachutes to make its own splashdown roughly 15 miles down range. The CXV , or Crew Transfer Vehicle , is a second-stage orbital spacecraft capsule from t/Space , launched from underneath a carrier craft such as White Knight Two . 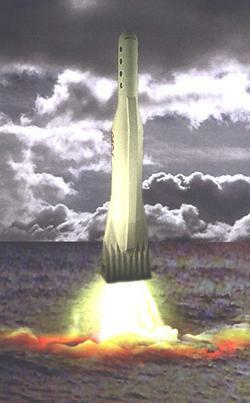 CXV is carried into orbit on a booster rocket. The return journey consists of a de-orbit burn, re-entry and parachute-assisted splashdown and recovery. Like SpaceX 's Dragon , CXV is initially targetted at providing service to the ISS , but could also rendezvous with other orbital destinations, or t/Space 's CEV (Crew Exploration Vehicle) design, which would be launched unmanned and is aimed at Earth-Moon transit. The XA ( eXtreme Altitude ) is a small suborbital VTOL RLV from Masten Space Systems , designed for scientific and educational payloads. daVinci is a reusable vertical takeoff and landing vehicle designed to carry three people into space and back. It does not take off from the ground, however. Instead, a piloted hot air balloon lifts the vehicle to an altitude of 40,000 ft. Twin LOX /kerosene engines then ignite with the vehicle suspended at a 60 degree attitude, and daVinci detaches from underneath the balloon before assuming vertical orientation and climbing to 130,000 ft. The engines then cut out and daVinci continues to rise without thrust to an eventual height of 120 km before descending back into the atmosphere, after approximately three minutes of weightlessness. Reentry and landing is achieved by deploying first an inflated shuttlecock for stability and then a protective inflated cone to shield the engines and cushion the landing. A parachute is deployed at 10,000 ft, slowing daVinci to 4 m/s on contact with the ground. An interesting feature of the vehicle is the use of external cameras to track the vehicle both on the way up and on reentry. The Cosmopolis XXI is a two-stage sub-oribtal spacecraft proposed by the Cosmopolis XXI Suborbital Corporation and Myasishchev Design Bureau ( MDB ) designed for sub-orbital space tourism. It is an X-Prize contender. The first stage carrier is the M-55X "Geophysika", which will climb to a 17km altitude before ascending at a steep angle to 20km where the second stage Cosmopolis XXI (or C-21 ) disengages and separates. The C-21 second stage is a rocket powered lifting body RLV capable of carrying a pilot and two passengers to a peak altitude of roughly 100km (62 miles). Once the rocket engine burns out the crew compartment separates from it, after which it will enters free-fall for a few minutes before descending and re-entering the atmosphere. Descent is achieved though the deployment of aerodynamic control surfaces, followed by a landing divided into an initial glide-phase and a final parachute-assisted touch down. 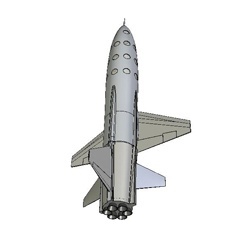 Proposed by Star-Raker Associates, Star-Raker is a single stage to orbit horizontal take off and landing ( SSTO HTOL ) vehicle intended to launch payloads of upto 50,000 lbs and 200,000 lbs in its standard and largest configurations, with an esitmated cost of $100/lb of payload to LEO . Low altitude engines comprise of ten supersonic multi-cycle airbreather ramjets, based on current existing technology, that lift the vehicle to 100,000ft at a speed of Mach 6 from take off at a conventional commercial airport, at which point rocket propulsion takes over. The aeroshell is a tri-delta form with Whitcomb airfoil lifting sections that provide a high volume for LOX /LH storage, the conical fuel tanks imparting increased strength and resiliance to the wing sections in normal flight and volumetric properties of comparable efficiency to normal rocket fueltanks when ballistic. A smaller potential X-Prize contender with a payload of 10,000lbs also exists. Kitten is a suborbital resuable vehicle taking three people, 1 pilot and two passengers, proposed by the Cerulean Freight Forwarding Company . Designed to attain an altitude of around 235km, the expected flight time is 45 minutes, of which 6 are in zero G. The craft is powered by novel ceramic composite engines with a fuel mixture of either Propane/Lox or Methane Lox. As well as being a potential X Prize contender, an expendable second stage named 'mitten' is also planned, to enable Kitten to launch microsatellites to LEO . CFFC intend to market Kitten as a kit for assembly as well as sold as a completed vehicle. Two larger versions of the vehicle are also proposed for the future: Calico , a short stay LEO vehicle capable of carrying 9 people or 2 tonnes of payload, and Angora , a much large vehicle capable of sustaining 40 people in LEO for up to two weeks, aimed at the space tourism market. Both these larger vehicles are designed to use a metallic wire mesh parafoil to assist in reentry. 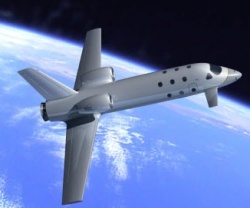 SCS is a fully recoverable fully reusable piloted passenger carrying sub-orbital 2-stage spaceplane being offered by Vela Technology Development and the basis of the ticket deposit scheme being offered by Zegrahm Space Voyages , intended to operate from and return to a commercial airport with a flight time of the order of 2�-3 hours. The booster stage, Sky Lifter, carries the second stage Space Cruiser underneath it on a pylon on twin turbojet engines. After separation, the second stage uses Nitrous Oxide/Propane pressure fed rocket engines to reach space. Zegrahm ultimately expects to be able to fly two flights a week whilst the vehicles are being designed to be capable of upto two flights a day. Space Cruiser ® and Sky Lifter ® are registered trademarks of Vela Technology Development, Inc.
As an example of how airbreathing engines could be used, the Pogo is intended as the first stage of a TSTO or MSTO launch system. Shown here using existing jet engines from the F-15 it is expected to reach at least Mach 2.5 and 80,000 ft before releasing a Pegasus-sized vehicle. Jet engines being developed for a proposed hypersonic commercial transport ("Hypersonic Transport Propulsion," Aerospace Engineering, June 1996, pp 7-11.) could take a much larger Pogo to Mach 5 and 100,000 ft. For many payload sizes, low-cost jet engines can do the job of rockets in the region where rockets are most expensive and inefficient. SKYLON is the successor to HOTOL being developed by Reaction Engines Ltd. It is an unpiloted fully reusable aircraft-like vehicle capable of transporting 12 tonnes of cargo into space and is intended as a replacement for expensive expendable launchers in the commerical market. An unusual and innovative strategy, SpaceCub is a sub-orbital four-seater rocket vehicle aimed at the future hobbyist market as an all-inclusive kit for an expected price of somewhere between a quarter and half $million, though you'll have to supply the fuel yourself. A possible X-Prize contender. The Space Van is designed to carry 16 passengers plus a flight crew of 3 to LEO . A reusable booster stage accelerates the orbiter to around mach 3 at 30km altitude; the relatively low velocity compared to other booster designs allows a simpler and less complex design. 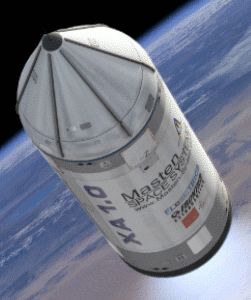 Proposed by Space Tour , an unmanned cargo carrying variant is also on the drawing board. The Delta Clipper was a proposed VTOL orbital vehicle. The DC-X and later DC-XA (derived from the DC-X ) were low-speed, reusable test-vehicles built by McDonnell Douglas which flew 12 times between 1993-96, until suffering major fire damage after falling over when a leg failed to deploy on landing. On a total budget of about $100 million provided mainly by the US Department of Defense (DoD) and McDonnell Douglas Aerospace, they demonstrated that reusable rocket vehicles can be flown repeatedly and routinely by a small team - essentially like an aircraft. Having inherited the project from the DoD, NASA cancelled it after spending some $40 million. Instead, NASA spent $1,300 million over 5 years on the X-33 and X-34 , neither of which ever flew before being cancelled. Go figure! 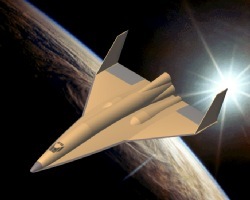 It's notable that, apart from its computers, the DC-X could have been built 30 years earlier - and indeed a proposal for such a vehicle was made at that time by the Douglas company, a fore-runner of McDonnell-Douglas. Why it wasn't built, and why NASA cancelled the the DC-XA , are key to the stagnation in the space industry. A sea-launched sub-orbital VTOHL rocket using LNG / LOX engines, the CAC-1 was intended to carry six passengers from port city to port city as a rapid transit service, a transatlantic flight taking about 12 minutes. Designed and promoted by Advent Launch Services , the project was eventually scrapped after the company failed to raise sufficient financing through a deposit scheme. The original start of commercial service was to be July 4 1999. A former X-Prize contender. A piloted, reusable SSTO VTOL rocket designed in the 1960s by Philip Bono of the (then) Douglas Aircraft company - the source of much SSTO VTOVL thinking. Based on the 3rd stage of the Saturn rocket, this would have been a great way to exploit some of the systems developed for the Apollo project. For political reasons SASSTO was not developed; the Saturn rocket was thrown away; and we had to wait until 1993 for the (much less capable) DC-X to demonstrate the first steps of the VTOVL approach. 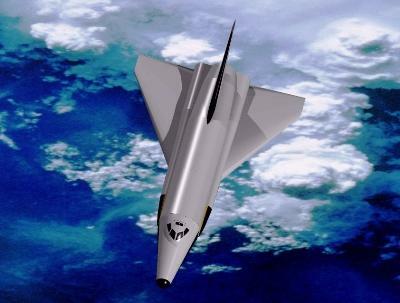 SASSTO was one of the earliest SSTO concepts to be proposed. It is the ancestor of Beta and Phoenix , which was in turn the inspiration for Roton , Kankoh-Maru and New Shepard . For more on SASSTO and some of the other vehicle designs in the same family, see "History of the Phoenix VTOL SSTO and Recent Developments in Single-Stage Launch Systems ". A technologically advanced 4 passenger SSTO spaceplane design from the company Lonestar Space Access (formerly Dynamica Research ), Cosmos Mariner uses conventional jet engines for take-off and landing, thus allowing it to use the existing FAA air traffic control system and make use of existing airport infrastructure, an issue which VTOL rockets have yet to address. The rocket engines are also planned to use jet fuel which is considerably less volatile than liquid hydrogen. Cosmos Mariner requires advanced and as yet undeveloped technologies though not all of them were needed for its X-Prize bid. A design for a reusable SSTO VTOL by Dietrich Koelle at MBB in the early 1970s (see "Beta, A Single Stage Reusable Ballistic Space Shuttle Concept "). A key study keeping the VTOL lineage alive! BETA 2 was a later version. One of the key vehicle designs in the lineage of VTOL rockets. Designed primarily by Gary Hudson and produced during the 1980s by Pacific American Launch Systems in a number of versions, including the "E" (excursion) version to carry passengers for the " Project Space Voyage " with the travel company Society Expeditions in 1985. Many of the same team went on to work on ROTON . Planned by Rotary Rocket Inc, the Roton was to use a centrifugally-pumped rocket motor for launch, and a helicopter rotor for descent. By their own estimate Rotary Rocket needed over $100 million for development, but managed to raise only $30 million, and so ceased trading in 2000. The photo on the left is of the Roton ATV (Atmospheric Test Vehicle) that was rolled out of its Mojave hangar facility in March 1999. This vehicle made 3 successful piloted test flights, demonstrating the feasibility of the rotor-assisted landing. In 1984, British Aerospace proposed the HOTOL horizontal takeoff single-stage-to-orbit reusable launcher. The concept featured a new type of airbreathing rocket engine that would have burned compressed air rather than liquid oxygen up to a speed of Mach 5. HOTOL was studied in great detail both by BAe and the ESA Winged Launcher Configuration study. The concept eventually gave way to Interim HOTOL in the early 1990s, a British/Russian joint proposal which replaced the (technologically risky) airbreathing rocket motor with existing Russian RD-0120 engines. The vehicle would have been launched piggy-back from a Russian Antonov 225 aircraft. Alan Bond, the inventor of HOTOL 's airbreathing propulsion system, later refined the concept as SKYLON, above. The Space Ship Xperimental was a modified version of the Phoenix VTOL rocket, used by Max Hunter to help persuade the US government to fund [an error occurred while processing this directive]VTOL[an error occurred while processing this directive] research, ultimately leading to the DC-X project. It is described in "Halfway to Anywhere" by [an error occurred while processing this directive]G Harry Stine[an error occurred while processing this directive] . 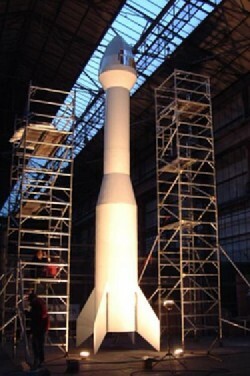 This is a design for a 2-stage [an error occurred while processing this directive]HTOL[an error occurred while processing this directive] launch vehicle produced initially by the company [an error occurred while processing this directive]MBB[an error occurred while processing this directive] in Germany (see "[an error occurred while processing this directive]Sanger: An Advanced Launcher System for Europe[an error occurred while processing this directive] "). The first stage would use air-breathing rocket engines (which have not yet been developed) to reach approximately Mach 6, at which the upper stage would separate and use rocket engines to reach orbit. 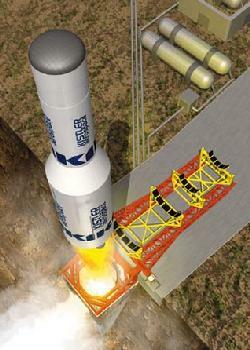 Piloted versions of the upper-stage have been designed to carry 36, 40 and 44 passengers. The "[an error occurred while processing this directive]X-33[an error occurred while processing this directive] " was announced by NASA in 1995 as an unpiloted, reusable [an error occurred while processing this directive]VTOHL[an error occurred while processing this directive] rocket test vehicle. It was expected to fly to speeds reaching Mach 13, with test flights starting in 1999. A supposedly commercial follow-on to the [an error occurred while processing this directive]X-33[an error occurred while processing this directive] demonstator. However, the proposer, Lockheed-Martin Corp, had stated that the satellite and government launch markets for which it was designed were not large enough to make it a viable business venture, and so it has expired with the [an error occurred while processing this directive]X-33[an error occurred while processing this directive] . By contrast, the piloted, reusable [an error occurred while processing this directive]HTOL[an error occurred while processing this directive] rocket-test-vehicle, the X-15, reached Mach 6.6, flying successfully 199 times in the 1960s. 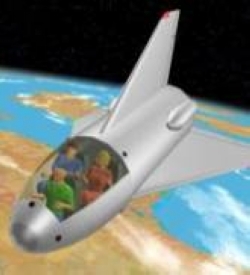 "Spaceplanes" that take off like an aeroplane and fly to orbit have been a dream of some space engineers and science fiction writers for decades. Expendable [an error occurred while processing this directive]SSTO[an error occurred while processing this directive] [an error occurred while processing this directive]VTOL[an error occurred while processing this directive] vehicles are simple to design using existing components (see "A Single-Stage-to-Orbit Thought Experiment "). By contrast, reusable [an error occurred while processing this directive]SSTO[an error occurred while processing this directive] [an error occurred while processing this directive]HTOL[an error occurred while processing this directive] vehicles aren't technologically possible today. Today, the competition is beteen [an error occurred while processing this directive]VTOL[an error occurred while processing this directive] [an error occurred while processing this directive]SSTO[an error occurred while processing this directive] designs like [an error occurred while processing this directive]Kankoh-Maru[an error occurred while processing this directive] and New Shepard and two-stage spaceplanes like SpaceShipTwo /White Knight Two . [an error occurred while processing this directive]VTOL[an error occurred while processing this directive] designs have the appeal of a single stage which avoids the engineering issues of in-flight separation. Spaceplanes have the advantage of a large legacy of practical aviation experience to draw on, and an easier fit with existing airport operations and regulations. Although, in future, new-technology air-breathing rocket engines may come to be used for some part of passenger launch vehicles' flight to orbit, it's difficult to make a convincing case that vehicles using technology that doesn't exist yet will be competitive with ones using known technology for at least the next few decades. Henry Ford didn't wait for the V-8 engine to be invented and developed before he started selling cars!